In Ireland, the life expectancy of men is, on average, is four and a half years younger than women. Men have higher death rates than women for all of the leading causes of death, including, heart attacks, heart disease, lung cancer, COPD and stroke. For men aged 15-34 years in Ireland, suicide remains the leading cause of death, surpassing the number of deaths from road traffic accidents. While many po or lifestyles can be responsible for a high proportion of chronic diseases amongst men once of the key problems is that men are more likely than women to present late to their GP when they have a health issue. This leads to a large number of problems becoming untreatable. For mental health related issues too despite shifting taboos on the topic, some difficulties still remain in terms of getting men to ‘speak out’ about mental health related issues. 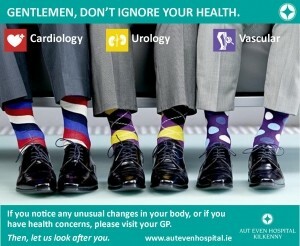 This year, all of Aut Even’s campaigns have been encouraging, both men and women, to visit their GP if they notice any unusual changes in their body or if they have specific health concerns.